3 bedroom, 2 bathroom. Private, plunge pool in quiet, residential area, close to Heywoods Beach. Emcee has 3 bedrooms and 2 bathrooms. (master and en-suite, with walk in shower, being upstairs, private balcony being off the master bedroom), 1 double downstairs and 2 single bedded room downstairs. Both rooms share downstairs bathroom which has bath and over head shower with large rose (also has shower head which detaches to ease showering young children), kitchen with dining area, large lounge with flat screen tv, internet and wifi, private veranda with shutters for outside sitting/living area, even when it rains! plunge pool and garden area. The interior is large and spacious, with an open aspect, light and airy. The kitchen is well equipped with cooker, 19 cu. Ft. Fridge/freezer, microwave, washer/ dryer in utility and the dining area seats 6. The property is air conditioned and fanned throughout. Emcee villa is suited to couples and/or families. It is our home from home, fitted out with everything required to make your vacation comfortable and homely. Our manageress, Helen, is there to help you with any questions, or advise and we are only an e mail away. The Heywoods Estate is situated opposite the Almond Beach and Port St. Charles resorts, on the North West coast of the island. The beach and local town are both within easy walking distance from the villa. (Ask Helen about the short cut too!) Frequently running and very cheap, public transport is accessed between the villa and the beach. On the subject of Air conditioning, these units are very powerful and consume alot of energy. We have imposed a surcharge fee for electrical consumption over and above 22 KwHrs (Units) per day of £0.15 per KwHr. (That is the actual cost price of electricity in Barbados.) Avoiding this surcharge is very simple. Don't run the air conditioning units 24/7. Shut them down when you leave the house. Treat this issue the same as you would central heating in Northern Europe. If exceeded , this leve will be deducted from the security deposit of £200. You can view your consumption from the electrical supply meter on the house. Kate is a Special needs teacher and I am an Engineering officer in the Merchant navy. My wife and I own Emcee, in Barbados and The Old Barn annex in Beckwithshaw, Harrogate. Both homes are very dear to us and guests have commented on how welcome they were made to feel in the home from home atmosphere in both properties. Indeed, we aim to offer our guests as much care as possible during their stays in warm and friendly environments. We have travelled quite a bit and stayed in many self-catering villas, both home and away and so have gleened from this what we all need during our breaks from reality. We hope you have an enjoyable and pleasant vacation wherever you decide to book. All the best. Andrew Scott. As I have said above, I work as a merchant seaman and know quite a bit about foreign shores. For me, Barbados has that mix of having familiar establishments yet having a different character. Barbados is very safe and the weather is 95% fantastic. We started coming to the island in 1994 and have vacationed here most years since. The people are friendly, helpful, chatty and warming. We purchased Emcee in 2008 from an English couple and annually we have made adaptations to the villa, refurbishing the bathrooms and pool in the past three years. Emcee sits in a quiet, friendly, safe neighbourhood, where you will become part of the local way of living, all witnessed from the veranda and upstairs balcony. We firmly believe our property offers outstanding value for money. We can meet you at the airport, stopping off to get basic provisions on the way to Emcee if wished and take you to the villa where you are met by our manageress and made to feel most welcome. Our manager's aim is to help all guests during their stay and she is on hand to solve any issues where possible. We enjoy hearing back from our guests and appreciate and take on board any comments they make which will allow other guests to enjoy their stay even more. We do appreciate guests reporting to Helen, any damages incurred during their stay. This is in order that they may be rectified for the following guests. We supply each set of our guests with our "Rough Guide" to Emcee and the island, with handy tips we have picked up while holidaying on the island and some great places to eat, drink, visit. Each week Annette will come to clean, change the beds and linen and tidy up. This time will be arranged on your arrival when you meet Helen. Emcee is our home from home in Barbados- relaxing, comfortable, breezy and spacious, open plan configuration downstairs, light and airy. Very high, beamed ceilings, mosquito nets and monkey bars on windows. Our plunge pool now has atmospheric lighting and a salt water, chlorination system, run from the utility/pump room. Bath 1: Master: large, walk in shower with rainforest rose, toilet, wash basin, cupboard, large mirror, feature shelving. Bath 2: downstairs. Bath, overhead shower with rainforest rose and hand held shower for easy bathing of children, toilet, wash basin with cupboard, large mirror. AC is in every room. Please switch off when not in room/out of villa and conserve energy. Annette cleans weekly. She will bed and towel change at the same time. Time arranged on arrival. Roughly four hours. In utility room. Top loader. US style. Wifi throughout villa. Code supplied by manageress. One beach towel per person. These are replaced fresh on cleaning day. Yes, we are wireless. We have fibre for TV, phone and internet. Lounge: 42 inch, flat screen TV. Free WiFi. 6-seater unit sofa, split into two seating areas. Air-conditioned and ceiling fan. We have also installed 3 UK 240v 3 pin electrical sockets. Dining area: 6-seater dining table. We use a cafetiere to make our coffee. There are two in the cupboard. Everything you need. Please do inform manageress if any dishes, or crockery require replacing due to damage, or breakage. Fully compact kitchen with all utensils required. Please inform manageress if anything breaks so as it can be replaced for following guests. Table and 6 chairs. Views onto verandah. Doors can be left open for ambience. See "Welcome Guide" on how to operate. Smart TV. In cupboard under crockery unit. Please feel free to exchange books. From master bedroom upstairs. Overlooks plunge pool. Sitting area. Evening sitting area. Ceiling fanned. Shutters. Very private. Upstairs terrace off Master bedroom. Has two large seats. Overlooks plunge pool. For water skiing, I always recomend my good friend , Jeremy Payne or his son Adrian, who live just up the road. His number is on the pin board in the kitchen. He can also arrange fishing and coastal picnic/safari trips. Sandy Lane and Royal Westmoreland are about 30 mins drive south. Plunge pool, with all regulation safety equipment. Lighting both internally and externally. Salt water chlorinator. We spent one week in this wonderful villa in Speightstown at the end of March. A short walk to downtown, grocery stores, art gallery, or the beaches and snorkeling. Lots of places to go for lunch or supper. Plunge pool was great to cool off after a long day of exploring. Hello Brian, Thank you to you and your group, for sharing your wonderful experience of staying at Emcee, in Speightstown, with HomeAway visitors. We really appreciate you taking time to write a review and thank you for choosing to stay with us. Please do come back again. We so enjoyed you staying. Until next time. Kate and Andrew. Hello Barry and Deb, Thank you very much for your kind review. We were so happy to host such a lovely couple. I shall certainly pass your comments on to our manageress, Helen and her team- they will be pleased to hear this. Our garden area is to be started in summer next year, with plans for a larger decking area and a wall to one side. Our pool was refurbished two summers ago and everyone is delighted with it. Now it is the turn of the surrounding area, all going well. Please do come again and see the results. Emcee is a smashing villa. Spacious and well equipped. The plunge pool particularly welcome after blisteringly hot days sightseeing. The air con is very effective and you need it. The beds are comfy and the living/kitchen with patio is bright and airy. Endless hot water from the solar panels. The neighbourhood is large and mostly families; everyone speaks to you and is friendly. One chap even said “thank you for coming” which was lovely. You feel very safe. You really need a car to stay here but watch out for the roads. Potholes a speciality! Two major supermarkets - Jordan’s in Speightstown is colourful and local. Massys in Holetown is very Waitrose/Whole Foods. Wine is hideously expensive. I'm glad I bought some at duty free in Bridgetown airport. The beer is good and cheap and the rum punch served everywhere is an experience. Powerful stuff. Speightstown has a charm of its own; lots of different shops and plenty of eateries. Worth visiting Hunte's Garden. It's a delight. The boat trips are good value for money and give that other perspective of the place. Dealings with Kate the owner have been delightful. All questions answered quickly. The local contact lady, Helen, dealt with our one issue speedily. Thoroughly recommend Emcee and would stay again. SatNav would help you find it more easily if arriving in the dark. In summary, great place, great location. There are so many rental properties to choose from around here but you won’t go far wrong with this sweet place. Hello Chris, Thank you so much for posting your review. We are touched that you enjoyed staying at Emcee and enjoyed her comfort and airiness. Yes, she is in a super neighbourhood with friendly people all around her, everyone looking out for one another. Helen is always on hand to help guests and has a super team behind her. Please do come again and explore more of this magical island. This place is just perfect, relaxing and magical! Having the pool was a fantastic bonus and the place is situated right near the beach and local amenities. We took our 3 year old and he had a great time. I would seriously recommend and we will be looking to come back. Superb value, excellent location, spacious and light, a home from home with some extras. We spent a month in Emcee and quite honestly it was not long enough. From the moment we entered this spacious villa, we felt very welcome and totally relaxed. So glad we arranged to have Jenni pick us up and thank you to the Scotts for arranging this for us. Kate and Andrew were so very helpful and accommodating; their Rough Guide being so interesting and helpful. Great ideas and suggestions made. Annette came once every week to clean the villa and to change the beds. A little added extra in our holiday and greatly appreciated. Speightstown has changed remarkably; its beach now having around 7 catering outlets, so really no need to leave Speightstown all vacation. We did read about a group who experienced extraordinarily, high, electrical consumption, but ours was well within the allowed 22 units per day, no problem. We simply ensured that the AC did not run when we were out of the villa. The beds were very comfy; the owners had just purchased new mattresses and we were first to use. Slept well and enjoyed early morning bird song from bed with a coffee, while looking out the window at tropical, palms. Whilst we were there, a company came to update the Wifi to super fast broadband- WOW, it is faster than we have at home. We always enjoyed our walks to Heywoods Beach either through the estate, or via the ginnel, which was a great short cut. Some evenings we had a sun downer at Port St Charles and saw "our beach" from the other side. We did hire a car, however it is very possible to access shopping and the beaches without one. We will certainly be back next year, so thank you for having us. Thank you for your superb review. So glad you enjoyed your stay at Emcee and that you too, loved Speightstown and how it is developing. We look forward to your return visit to us next year. As always, there will be more updates and refurbishments for you to experience, both in Emcee, as well as in Speightstown. I was at Emcee from March 29th to April 8th, 2018. 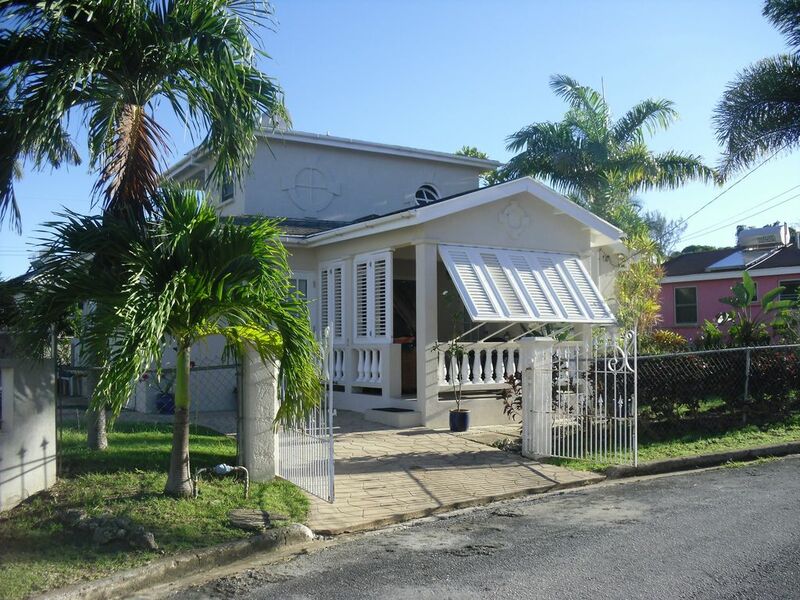 The house is absolutely beautiful, the location is great, walking distance to the beach and Speightstown. Full size fridge and stove, washer and dryer, plunge pool, you have everything you need in a nice and quiet neighborhood. Our issue started at check in. Since this property has a surcharge fee for electrical consumption over and above 22 KwHrs units per day, the property manager left us a note with some instructions and the meter reading. Once she left, we unpacked our car and luggage and decided to take a picture of the meter, the reading was up 286, and our total for our stay was only 220. In 20 minutes that it took to unpack, the meter went up 286. something is not right. Being mature professional working adults, we didn't stress over this insignificant issue, we had proof through pictures that were stamped with the date and time so we didn't fuss over it. We thought we would simply show the owner the pictures and he would see the discrepancies in the 2 meter readings. I'm shocked to say that we were wrong. The owner accused us of running the AC units with the windows open 24/7. When he was given the pictures he claimed they were too blurry to read. I wish I could attach them here so future customers could see how blurry they are. The pictures were taken in the beautiful Barbados weather with blue skies with a professional camera, they're far from being blurry. My advice to potential renters is to negotiate the electrical consumption in the price. This would alleviate the issue we had with an unsympathetic owner that accused us of, heaven for bid, using electricity and then claiming the proof was blurry. Hello Jason. Thank you for reviewing Emcee, our villa and yes, she "is absolutely beautiful, in a quiet neighbourhood, great location within easy walking distance to beach and town. Super facilities and plunge pool- everything you need." Your party booked in Christine's name, however you Jason, wrote the review, so I now answer your views on the electrical points raised. We have rented out our villa for almost 10 years. Never before, or since your stay, have we, as a team, been questioned about our electrical sur -charge. Taking up your suggestion, we did contact BLP asking them to monitor our meter. They did, fully passing it. The meter is made up of a set of small clocks (as are all villas in our area) and for persons who do not read them regularly, they can be tricky to comprehend. Our manageress looks after several properties on the island and is accustomed to carrying out this activity, as are BLP. YOU FAILED TO MENTION IN YOUR REVIEW THAT YOUR PARTY OMITTED TO GIVE OUR MANAGERESS THE £200 damage/over-electrical usage deposit. This is clearly stated in correspondence issued by VRBO. Also, you arranged to meet our manageress at the end of your 10 night stay, at 1400 in Emcee, to hand over keys and to say, "Goodbye", as one does. You departed at 1330, half hour earlier than arranged. We can not understand why you did this after taking several photos of the meter throughout your holiday? Our manageress finalised the readings, alone, reporting your consumption to be 78.3 units daily. (she also discovered the hot water heater switch at "On", having been switched on during your stay) Your booker, Christine, gave me her readings, averaging 49.7 units daily and you stated, Jason, the party's usage to be 22 units daily. (matches our allowance exactly!) The party of 5 prior to your stay consumed around 16 units daily and the party of 2, post your stay, used 9 units daily. (We use roughly, 11-16 daily) We operate a fair system. 22 units of electricity included in your stay's rental amount. Extra usage agreed on at departure and paid for out of the £200 deposit GIVEN ON ARRIVAL. Our only other guests who left early at departure,(giving us a 5* rating) left without their £200. I gladly wired this to them in Canada, paying to do so. We have NOT ASKED YOU FOR ANY EXTRA MONEY. We left this to Christine's discretion. To end, my husband is a seafarer. His ship has no power to upload/download attachments. Emcee's power = relaxation, comfort, beauty and fairness to all. My special interest is eating and drinking. And Barbados is a fantastic place to indulge those pleasures. But don't bother to pick up a glossy magazine which tells you about all those flashy restaurants where all the celebs go, because we supply our own "Rough Guide". And after 20 years of chewing and slurping my way down the west coast, I'm fairly sure I'm giving some good council. Heywoods beach, on the west coast, is a 5-10 minute walk. All other beaches running along the coast can be accessed by public transport or private car. However there is limited parking at the most popular spots (Mullins), so we would recommend the bus. Water skiing is available on the beach. I've left Jeremy's business card in the kitchen. His boat is available for skiing and fishing also. Grantley Adams Airport: We can arrange your pickup and "meet & greet" either at the airport, or villa. Due to our proximity to the beach, town and local bus services, there is no need to hire a car. It does come in handy, though. We do recommend one company we have found, who are a family run, reliable rental company and they will deliver to the villa. Speightstown has increased its eateries over the years and has a wide selection of interesting places along the coast road. No need at all to venture south. Most restaurants have sea views and are very pleasant to while away the hours in. Speightstown beach is pleasant and lively, in a quiet, un-touristy way. Speightstown: 6-8 mins walk. Holetown: 10-15 mins by car/bus. Bridgetown: 35-40 mins by car/bus. Bathsheba (East Coast) 30 mins car, 60 mins bus. Speightstown contains a range of food markets, stores, banks, art galleries, bars and restaurants. Notably the "Fishermans" which is on the beach and is very reasonably priced. Scuba-diving can also be organised from "Reefs & Wreckers". We supply you with a "Rough Guide" which is a result of our 20 year holiday affair with Barbados. Not only does it give you a great insight of the island, you can also save at least £50 per person. In the past 5 years, Speightstown has broadened its eateries and now offers great choice and venue for all types of people. Booking Notes: When booking, a 25% deposit will be required, with the final payment due 8 weeks prior to occupation. A refundable security payment of the equivalent of £200 is part of your payment to HomeAway. If the holiday group has used over electrical consumption of 22kw/hours per day, then the amount will be deducted from this deposit before being returned to you via HomeAway. Changeover Day: No specific changeover day. Notes on prices: We are happy to further negotiate rates for long term rentals. There is a surcharge on electrical consumption over 22 KwHrs (units) per day of 22p per unit, which is the cost of electricity in Barbados. Avoiding this charge is very simple. Don't run the air conditioning 24/7.If your metre reading at the end of your vacation is over the allocated consumption, the extra cost will be deducted by the manager, from your security deposit before you leave the villa.